The November board minutes were read and approved by Supervisors Freeman & Landstrom. All ayes, motion carried. November financials were available for review. With the changes after the current state elections and with the changing of the seasons the work that was being done by the local ATV club towards a Grant and Aid Trail appears to be at a standstill. A discussion of local trails may continue in the fall of 2007. It was brought to the attention of the board that if a conversion to November local elections were to be discussed and considered at the March Annual Meeting a resolution needed to be passed by the board attesting to their plan to change the election month. Within that resolution a schedule of terms of office for the transition must be provided. This topic will be further discussed at the January meeting. ∙ Freeman moved to adjourn the meeting at 8:00 PM. Fry seconded, motion carried. The meeting was called to order by Chair Freeman at 7:35 PM. September board minutes read and approved by Supervisors Freeman & Landstrom. All ayes, motion carried. September special board minutes read and approved by Supervisors Freeman & Landstrom. All ayes, motion carried. Draft of Zoning Classification Request read and approved to proceed to submission to planning commission by unanimous vote. County Commissioner Peg Sweeney in attendance. Presented county side of the trail proposal and what had happened at County Board Meeting Today. Tried to rescind county resolution concerning trail and failed. Stressed that the trail was just conceptual. County board passed resolution requesting that the trail only be on State and County land. Current trail design does not meet parameters specified by the State. DNR has not decided which county will be awarded the trail. Minimum of 2 public hearings are required for any trail. Trail would not use any county or twp right of way. No confiscation of private land. Answered questions to the best of her ability with the information that was available. Lots of questions from the floor. She supports ATV trail in county, but not necessarily here. Steve Johnson from hwy dept attended to answer questions about ROW. ATV can ride in ditch bottom or backslope. HWY dept intention was just for road. Are there permits issued to Pequaywan Inn for anything? ∙ Freeman moved to adjourn the meeting at 9:00 PM. Landstrom seconded, motion carried. The meeting was called to order by Chair Freeman at 8:45 PM. August board minutes read and approved by Supervisors Freeman & Landstrom. All ayes, motion carried. Stoneburner reported that there was unexpected revenue that he contributed to the double levy in the year 2005. In relation to that Arndt reported that the deadline for filing of the Final Town Levies for 2006 to be collected in 2007 is September 15th. ∙ Freeman moved to file a zero final levy for 2006 to be collected in 2007 to correct the double levy imposed in 2005. Fry seconded. All ayes, motion carried. Arndt will drop off the Final Town Levies form and speak with Richard Olson, Deputy St Louis County Auditor, to make sure the filing is done correctly and that a zero levy is appropriate as he stated verbally by the phone. The board agreed that if we loose our gas tax money when filing in this manner that it would be okay. 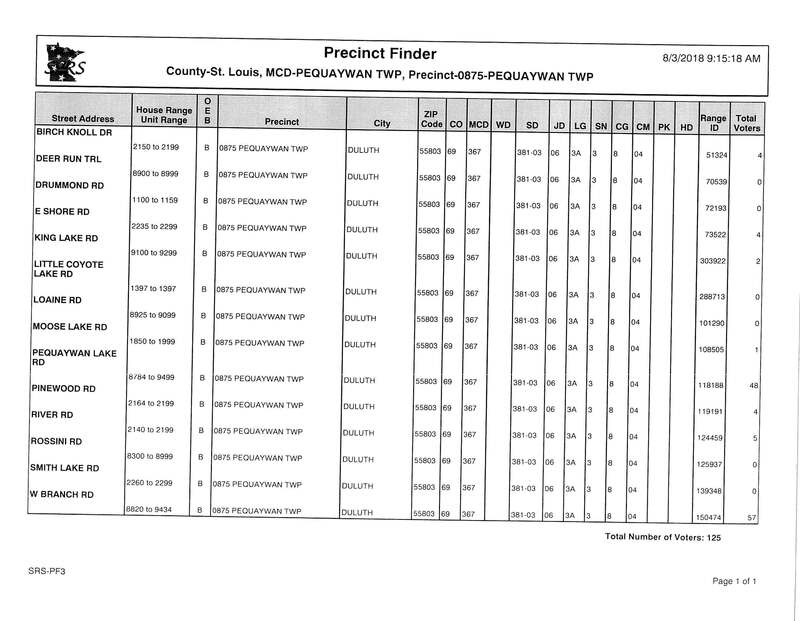 Do we need to approve St Louis County All Hazard Mitigation Plan? ∙ Fry moved to approve the St Louis County All Hazard Mitigation Plan. Landstrom seconded. All ayes, motion carried. Fire chief Lucia was consulted to see if we needed to file this form as the VFD had already done so. It was agreed that the Township should also approve the Plan. It was clarified that as previously discussed that a plastic sleeve would be used to protect any posting and it would be attached using the magnetic letters. Stoneburner is making inquiries about the insurance coverage for the Auto Mark voting machine and will report back at the October meeting. ∙ Freeman moved to approved Pequaywan Lake Volunteer Fire Department/Pequaywan Township Agreement that states PVFD agrees to burn brush piles at the Wet Lake Gravel Pit as per agreement with St Louis County and Pequaywan Township. Landstrom seconded. All ayes, motion carried. ∙ Freeman moved to adjourn the meeting at 8:45 PM. Landstrom seconded, motion carried. Fry reiterated that the Township is considering requesting St Louis County Planning Commission to rezone all Resident 5 lakes to Resident 4 to restrict compressed development on smaller, shallow lakes. This would change new building requirements to be 4.5 areas and 300 feet of shoreline frontage (current Res 4 is 2.5 acres and 200 feet frontage). The most recent discussions with the DNR advises that Pequaywan is heading in the right direction and the Planning and Zoning advised that this is being discussed to be done at the county level but in 2-3 years time. Planning and Zoning advised that it was improbable to consider going from Resident 5 to Wild and Scenic zoning, as discussed at the August meeting, but that it would be considered reasonable to request rezoning from Resident 5 to Resident 4. Comments were heard that they felt that this issue will likely intensify statewide and also that it should be something done at the County level. After discussion it was agreed that a draft would be presented to Mark Johnson of the St. Louis County Planning and Zoning to get his input. The matter will be discussed at the regular October Town Meeting. July board minutes read and approved by Supervisors Freeman & Fry. Treasures report approved by Freeman & Fry. It was agreed that residents of the Unorganized Township and Pequaywan Township would have access to this waste management site. Accepted items will be leaves, grass clippings, pine needles, twigs/branches no larger than 8″ in diameter. Any material brought to site in bags must be empted and bags removed. No stumps, no roots, no trees allowed. There will be zero tolerance of abuse of this program – if abuse occurs the site will be closed to all residents. Surrounding Townships were called and very few of them offered internet access. The citizen that had requested the postings on the internet was called by Chair Freeman and after discussion he felt the citizen thought that postings of public meetings on Pequaywan.com and the available of requesting copies from the Town Clerk was sufficient. Any citizen can request copies by providing a written request to the Town Clerk and at the expense of twenty-five cents per page. Minutes can also be viewed at the VFD by making arrangements with the Town Clerk. Bob Hirsch has advised that materials have been ordered and he has been paid half of his bid. A second bid will be necessary to include an enclosed space below the original sign. His lead time is to be 4-6 weeks. The contract for the improvements has been signed by the appropriate staff at the state level and work will be completed ASAP. Tabled until the September meeting. Freeman will discuss with Fire Chief John Lucia about the necessity of this approval and report back in September. Arndt presented information about beginner courses being offered by MN Council on Foundations for grant writing. Arndt advised that perhaps some staff from the Township should consider taking the course and also provided a copy of information for the VFD. Arndt was advised that any training applicable to the township duties is permissibly and to review upcoming class dates if she wishes to attend. Arndt was advised to discuss insurance of the Auto Mark voting machine with treasurer Stoneburner. ∙ Freeman moved to adjourn the meeting at 7:55 PM. Fry seconded, motion carried. As the result of development of additional lots on King Lake, concerned citizens brought to the Township the topic of zoning to restrict compressed development on smaller, shallow lakes. Fry has reported that to initiate the process of possible rezoning a Special Meeting was to be held seeking citizen input and subsequently a resolution from the Township requesting the County to consider our requests. St Louis County has encouraged the Township to consider this process but acknowledges that it is a very political topic. Town Board discussed that they would be more comfortable with the knowledgeable staff of DNR and St Louis County Planning and Zoning making any rezoning decisions. Citizens commended that it is the responsible of the Township to protect our community and another comment was that perhaps the rezoning topic was directed back to the Township as local officials would be more informed of the local lakes . Fry has made numerous calls and still has not deemed what standards should be considered for each zoning and what density would be appropriate. A zoning category of Wild and Scenic was discussed. Citizens commented that common sense would tell us that less dense development on smaller, shallow lakes would be best for the community and the health of the lake and the environment. After discussion it was determined that Fry will make additional phone calls to the Planning and Zoning Department and the DNR to clarify various issues. It was also suggested that he contact Morse County who has gone through the rezoning process. A second Special Meeting will be called on September 12th after the regular monthly meeting. Fry will seek names of the appropriate people to invite to that meeting to provide information on this complicated issue and these names will be provide to Clerk Arndt and a formal request and invitation will be made. June board minutes read and approved by Supervisors Freeman & Fry. Bob Hirsch submitted bid for construction of new town sign. The design consists of metal framing and magnetic lettering and a decorative design at the top. This design and the design submitted by Highland Signs were discussed. ∙ Landstrom moved to authorized the expenditure for a new town sign from Bob Hirsch asking that he modify the design to include a weather proof section for postings. Freeman seconded the motion. All ayes, motion carried. Fry advises that after discussion with the county that we reconsider advisory signs on West Branch Road. It is possible that if Pequaywan puts up signs it can be construed to mean that we make these areas official walkways/bikepaths/atv accessible and could be considered liability if accidents occur. It was noted that private residents can put up signs if they choose on their property. No action taken . Pequaywan was awarded the HAVA grant for polling place handicap accessible improvements in the amount of $7,045.00. The award if for parking and paving in the amount of $3,650 (400 sq ft concrete), $520.00 for signs, and $2,875.00 for auto HYD closer entry door and lockset. Application for funds to upgrade vanity, install grab bars, and refinish wall and floor at the old vanity location was not granted. The work has however been authorized to complete the handicap accessible construction at the PVFD. The Agreement for Yard Waste Management between St Louis County and Pequaywan Township was read and discussed. As the Agreement reads materials allowed will be grass clipping, leaves, pine needles, branches and twigs. No trees, roots, or stumps will be accepted. The Board determined that a maximum diameter of 8″ for branches will be allowed. It is cautioned that there will be zero tolerance for abuse of this site and if abuse is noted the site will no longer be made available to any residents. To start with the program will offer two dates in the fall and two dates in the spring. Appropriate dates will be discussed at the July 22 Pequaywan Lake Association Meeting. As the material dries and as the contract reads the site needs to be burned and the fire department has informally agreed to do the burning. It was determined that a public meeting will be held on August 8th immediately after the regular town meeting. The purpose of the meeting is to discuss rezoning of R5 lake properties to R4. Lakes affected will be listed at that time and a resolution to present to the County will be drafted. Arndt was directed to post a public notice of the special meeting. The request for a township prize donation to the 2006 MAT Annual Conference was tabled. Arndt advised that a conversation was had with the former clerk and it was determined that as the township does no improvements on properties and therefore there are no outstanding payments that a response of “ None” and “No Township Improvements” should be made and forms mailed back to the title companies. ∙ Freeman moved to endorse the IS700 National Incident Management System. Landstrom seconded. All ayes, motion carried. A 4 hour training for the VFD was recently held and it was learned that in order for the Fire Department to remain eligible for grant funding a resolution endorsing the IS700 NIMS was necessary. The IS700 NIMS is a management plan on how to deal with a national incident. An email from a seasonal resident was read by Arndt. It requested that the Board Minutes be placed on the internet to make it easier for all residents, especially those who are not able to attend the meetings, to have access to the business discussed at the meetings. Discussion was had that it be appropriate for only approved minutes to be posted, that a tighter reporting fashion of minutes might be necessary, and it was also discussed that to have full control that a township (or other government entity) site should be where the minutes be posted. Board members will research how other townships handle this issue and the matter will be discussed at the August meeting. A resident reported that after a minor incident on Birch Knoll Drive that the US Postal Service will no longer drive up to the individual homes on Birch Knoll Drive. Mail had been delivered previously for many years. He didn’t expect action but wanted the Board to be made aware of the issue. ∙ Freeman moved to adjourn the meeting at 8:40 PM. Landstrom seconded, motion carried. May board minutes read and approved by Supervisors Freeman & Landstrom. Sharon Lewerer, Information Specialist, at the non-emergency 911 number 218-726-2920, addressing division at St Louis County advises that if residents request 911 signs they would cost $25.00. Pequaywan board discussed safety and felt that fire fighters and first responders are not hindered by current signage and suggest residents that wish to have the new style sign contact the County for assistance. Freeman will contact local resident Bob Hirsch to see if he could produce and if he would be interested in developing a new town sign. Also, Mike Degrio, of Northern Graphics & Highland Signs ( 727-1294 or 722-7086) has been met with and will produce a graphic layout and email a couple of designs for a new sign. The graphics will be reviewed at the July meeting along with discussing response from Hirsch. Fry will check with County about proper placement of signs cautioning drivers of children at play, bikers, ATV riders, and walkers. ∙ Landstrom moved to authorize Fry to purchase signs cautioning drivers of children at play, bikers, ATV riders and walkers to be placed on West Branch Road. Freeman seconded the motion. All ayes, motion carried. The HAVA grant for polling place handicap accessible was to have been awarded on June 7th. The administrator of the grant was contacted on June 13th and she advised that the final decisions had not been made yet and a letter would be mailed on Friday June 16th. ∙ Fry moved to accept John Lucia’s proposal as written for the handicap accessible improvements. Freeman seconded the motion. All ayes, motion carried. ∙ Fry moved to authorize the handicap accessible improvements to be done after notification of HAVA grant award. Freeman seconded. All ayes, motion carried. A call was made to the South St Louis Count Land Manager John Thompson at 218-625-3700 (5713 Old Miller Truck Hwy, Duluth, MN 55811) to inquire about an agreement for a yard waste managment site on County property. Forester Roff within that office advised that a letter from Pequaywan making a request for county land use for yard waste management would start the procedure. A copy of the agreement letter that North Star is working under was reviewed to deem the criteria they work under. Roff proposed the gravel pit off Hwy 44 to be a logical site. ∙ Freeman moved to authorize Arndt to write a letter requesting the use of County land for a yard waste management site for the residents of Pequaywan. Landstrom seconded the motion. All ayes, motion carried. Sue Johnson has honored our request and posted a slow down notice on her website. Pequaywan supervisors agree to support requesting the County to rezone R5 lake properties to R4 for lakes that are less than 80 acres and are 10′ or less in depth for new construction. This would change the current guidelines of 200′ of shoreline and 2 ½ acres to 300′ frontage and 4 ½ acres. Fry will contact County to confirm procedure of postings for public meeting and this matter will be discussed further at the July town meeting. ∙ Freeman moved to adjourn the meeting at 8:30 PM. Landstrom seconded, motion carried. No progress on township sign. Arndt filed a grant application for the handicap access improvements. Town board will wait to see how much of the grant is awarded before getting started on improvement. Calls will be made to the county for help with proper signage on West Branch Road. Sue Johnson will be contacted to request placing a notice concerning speed on her website. A letter will be prepared to be presented to the Lake Association about speed on West Branch Road. Placement of new style 911 sign is normally initiated by the fire department. No action was taken by the Town Board at this time. Estimated cost of 911 signs is $20,000. Clearing the area around current 911 signs would help with visibility. The tax overcharge situation has not been resolved. It was suggested that the Township Association attorney be contacted about any problems that might be caused by a zero charge for township taxes next year and to see if there would be any adverse problems. ∙ Freeman moved to adjourn the meeting at 8:06 PM. Landstrom seconded, motion carried. The meeting was called to order by Chair Freeman and the Oath of Office was taken by Freeman and Arndt. ∙ Freeman moved to approve the March minutes as reported, Fry seconded. Motion carried. Treasurer’s Report provided prior to the meeting and mailed with supervisors per diem. Fry reported on the information he gathered from St Louis County Planning and Zoning concerning possible re-zoning of lakeshore properties. He was advised that re-zoning should be considered township wide providing sound reasoning for the proposed changes. Further it would be helpful that if re-zoning was requested that adjoining townships joined Pequaywan in the request for re-zoning. Re-zoning changes must be presented as a request and is not automatically authorized and would pertain to new development only. If a meeting was to be convened to discuss re-zoning the meeting would need to be posted and public input taken. The current DNR regulations are 30-40 years old with current zoning of Res-5 being 2 ½ acres and 200′ of frontage. Re-zoning to Res 4 would require 4 ½ acres with 300′ of frontage. The DNR considers “literal area” of a lake to be the acreage that is 15′ or less in depth. One example of this was given as Big Pequaywan having acreage of 418 but has “literal area” of 240 acres. The advantages of Res 4 include less impact on the environment, better water quality and more privacy. One disadvantage would be less profit margin for the development. Fry was advised that many communities are considering re-zoning of lake property and he will continue gathering information to be presented at the May meeting. Freeman inquired if any information was available from the Pequaywan Fire Department’s desire to manage a burning site. Ron Sluka advised that he consulted with the DNR Two Harbors division and the party he talked with had no knowledge of any grant funding. The DRN advised that anyone can get a permit but cautioned about fencing, establishing responsibility etc. Sluka’s understanding is that the fire department would not be interested in taking on this project. This topic will be discussed at the May 20th Lake Association Meeting. Freeman will make a call again to 911 to inquire if perhaps funding is available for this. It was discussed that placement requirements would need to be strictly adhered to and the issue of calling prior to digging could prove time consuming. Discussion was had that new construction (septic design) seems to entitle homeowner to new sign without cost. Fry was unsuccessful in meeting with contact to discuss new township sign. The Auto Mark (disability voting equipment) is tentatively scheduled for delivery the end of May. The purchase is made by St Louis County who will provide training and will advise of delivery/pick-up information. Initial cost of operation and maintenance should be covered until 2010 by funds set aside for HAVA according to the Auditor’s office. The Board of Appeals and Equalization is tentatively scheduled for May 3rd 7-8 PM at the Fire Hall. This appeals process is an opportunity for homeowners to question the value or tax category their property is given. Freeman advised that an error has been made on the township portion of the 2006 tax statements. A correction letter had been mailed to the County but the County advises that it was never received. It will be discussed at a future meeting but it appears that a possible legal solution is to skip one year of assessment to bring the balance back to zero. Letters to homeowners may be written to clarify the situation and also a letter may be written to Commissioner Peg Sweeney to draw attention to the shortcomings witnessed while trying to resolve this matter with the County. Freeman advised that a discussion will need to be held with Contractor John Lucia to set in motion bringing the Fire Hall up to standards for handicap assessibility. ∙ Fry moves to authorize Arndt to purchase a tape recorder with the expense not to exceed $100.00. Freeman seconded, motion carried. It was noted that the tape recordings made of meetings by the Board are solely intended for the purpose of assisting the clerk to develop accurate minutes. Such tapes are not part of the Township’s official records. Fry reported that he has received a complaint about speeding vehicles. As the township has no enforcement of speed signs he notes that a advisory sign could be posted to alert drivers and make them more aware. He will check into the cost of an advisory sign. He noted that the legal speed on a township road is 35 MPH and an advisory sign would be 20 MPH. Fry also noted that he will be sweeping roads on the morning of April 21st. ∙ Freeman moved to adjourn the meeting at 8:20 PM. Fry seconded, motion carried.